Mirah Belle introduces unadulterated, pure essential oils that improve the health of your skin, hair and body. These 100% Pure Essential Oils offer a variety of benefits from cosmetic, dietary purposes and are known for their healing effects mentally, physically and emotionally. 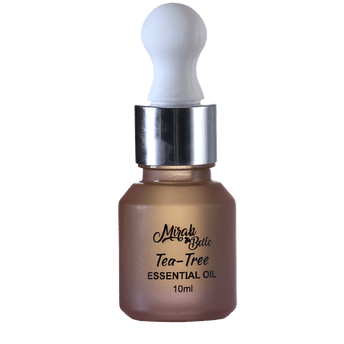 Mirah Belle's Tea Tree Essential Oil has amazing health benefits and carries nourishing, antibacterial, antimicrobial and antiseptic properties. It is suitable to be used on skin and hair. Tea tree essential oil for the hair: The tea tree essential oil is an easy and an effective way of maintaining healthy hair and a healthy scalp. The tea tree oil is also helpful in unclogging the hair follicles and in nourishing the roots. The oil leaves you feeling refreshed and also has a tingling feeling on the scalp. Tea tree essential oil for the skin: The tea tree oil is also very effective against staph infections, even those that are antibiotic resistant. For those of you suffering from psoriasis, the regular use of tea tree oil helps to relieve the itching.